A buffalo is led to the field during the buffalo fighting festival in Hanoi on Feb. 22, 2014. 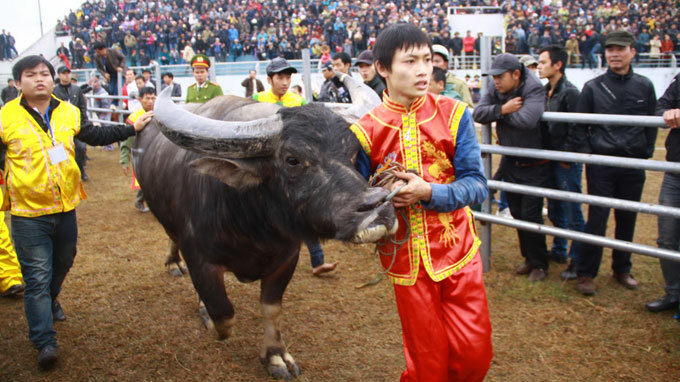 A buffalo fighting festival featuring 32 buffalos was held for the first time in Hanoi. According to the organizers, some 30,000 people flocked to Phuc Tho stadium based in Hanoi on Saturday to watch the tough buffalo battles. The animals - aged between 8 and 15, weighing at least 500kg each - hail from northern localities that are famous for buffalo fests such as Do Son in Hai Phong city, Song Lo in Vinh Phuc province, and Ham Yen in Tuyen Quang province. They competed in the qualifying rounds on Feb. 22 and the winners of the rounds will be selected for the final one day later. The entrance tickets to the opening day was sold for VND100,000 (US$5) each while it costs VND150,000 ($7.5) for the final. All the buffalos at the event will be slaughtered after the competition and their meat is to be sold at high prices from VND500,000 ($25) to VND3 million ($150) per kg due to a belief that eating their meat would bring good luck and prosperity for the new year.